It is always a surprise – and a happy one – to come across a ‘new’ wine. The Broad Valley Pinot Noir 2014 was way more than a pleasurable experience. And it came with a 2 litre barrel of the Estate’s Extra Virgin Olive Oil. In the Broad Valley Pinot Noir 2014, I found a delicious wine which had gone through classic wine making techniques. Pinot Noir is a grape which takes up its surroundings, it soil and the winemaker’s art, perhaps more than most. Thin skinned and low in both colour and tannins. Harvested in the cool of the evening, the grapes are taken to the cellar and after destalking the berries go to open top fermenters for a 10-day period of cold soaking before fermentation. Both gentle punch downs and pump overs too place. Once the alcoholic fermentation has taken place, the wine is taken to 225 litre French oak barrels 25% of them new and the remainder made up of second, third and fourth barrels. It remained there, without racking for 11 months. Batonnage took place during this time. The wine was then prepared for bottling. From a Burgundy shaped bottle, with a natural cork closure. Simple elegant livery. In the glass, it is an almost translucent cherry red. Whiffs of raspberry, fynbos herbaceousness, and petrichor. Richly flavoured with generous fruit, well supported by the tannins. Long ending. A wine made for food. Butter roasted organic chicken, seared tuna, and the traditional Burgundian dishes in which the wine is used and also accompanied – Coq au Vin and Beef Bourguignon. Using their state of the art Oliomio Olive Oil Press, a blend of various varieties of hand-harvested and cold pressed olives, amongst them Frantoio and Coratina, ensure broad flavours and medium body. The flavours are of pine nuts, rocket and a pleasant green peppery bitterness. 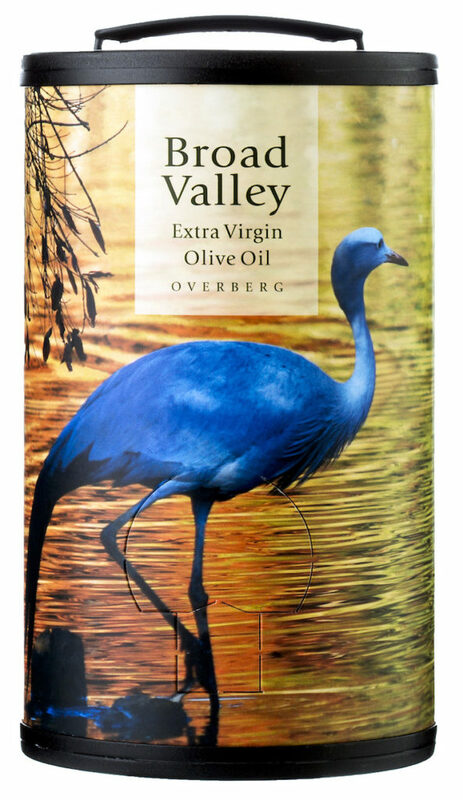 The barrel shaped container is illustrated with our national bird, the Blue Crane. It has a handy little free flowing tap attached to a foil bag which collapses as the oil is used ensuring no access to oxygen.